As any of the KP staff could tell you, I was getting impatient. 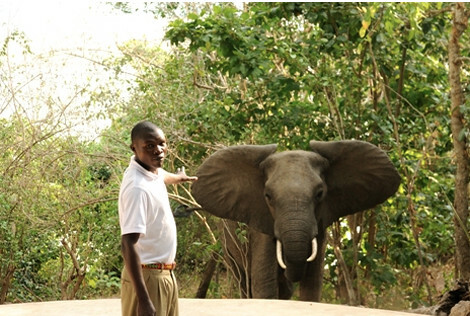 By the start of August last year, elephants were frequently meandering along the river bank through camp. This year, however, perhaps because the rains lasted longer into June than usual, the ellies have been slow in returning to the riverine habitat around Kiba. To put it simply, I missed them. But a week ago, they came back. One evening they showed up right on our doorstep as we were about to sit down to dinner. An hour later, our food was cold when we finally made it to the table. 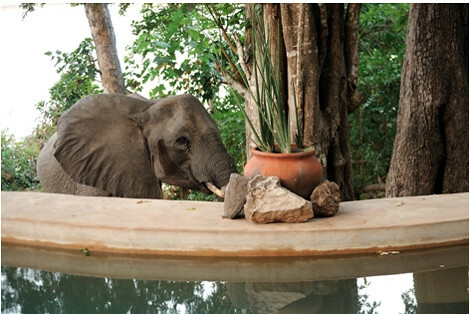 We all gathered around the pool as a dozen elephants, and two very young calves, ably picked up small wild dates off the ground. It was nice to see a couple of young calves with the herd. One (not pictured), was still small enough to fit under her mother's belly, meaning she's less than 6 months old. Even Michael, one of our waiters, was happy to see them come back. For him, elephants can be a challenge as he sometimes has to dodge them when bringing food from the kitchen to the table. Of course 5-ton visitors do have some drawbacks. 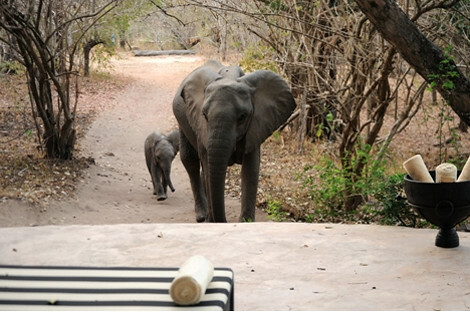 Guests have been late for their flights because the ellies blockaded their rooms. We are now subject to sudden wake-up calls in the middle of the night as elephants smash their way through the bush. And while elephants are only too happy to use our well swept paths to move through camp, they never hesitate to fell trees and branches that block our way.